So I follow other Kettlebell Sport athlete's blogs. One I like in particular is John Wild Buckley's blog. John is an entertaining writer, and I've enjoyed reading about his progress in the sport and discipline of kettlebell lifting. I was positively enthralled by his accounts of visiting Siberia, and learning under the great coach Sergey Rudnev. In a May 21 blog post, John recounted an informal demonstration and contest between two famous kettlebell sport champions, Sergey Rachinsky and Sergei Merkulin. In a recent IKSFA sport camp in St Petersburg, Rachinsky and Merkulin demonstrated Long Cycle technique by engaging in a 5:00 2x32kg contest. Their first five minutes ended in a tie of 44 reps each, for an average of 8.8 reps per minute (rpm). Not satisfied with a tie, the two decided to compete again to determine a winner. They decided a a 2:00 sprint set would be the tie breaker. Both lifters went all out, at a much faster pace than either would use for a 5:00 training set. Merkulin finished with with 24 reps (12 rpm). Rachinsky finished with 26 (13 rpm). At the end of his effort, Rachinsky fell to his knees. It was an exciting contest, to be sure. After reading the blog post, I checked my email and looked over my YouTube subscriptions. One of them is the channel of Ivan Denisov. 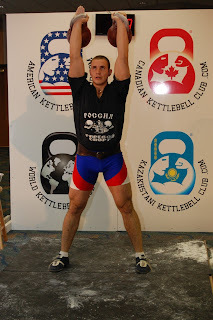 Denisov is the absolute world champion and record holder in Kettlebell sport, and is a coach and adviser for the World Kettlebell Club (WKC). Ivan often posts competition videos of the athletes he coaches, as well as videos of his regular workouts and competitions. One new video in particular caught my attention. An ordinary, 6 minute set of 2x32kg Long cycle during a recent workout. Denisov uploaded the video on May 13. Looking over Denisov's competition records, it appears that 12 rpm is not a sprint pace for Denisov the way it is for other world class athletes. As a matter of fact, he has completed 116 reps in 10:00 (11.6 rpm)....the world record. I do not mean to take anything away from Rachinsky or Merkulin. They are two of the greatest kettlebell sport athletes to ever set foot on the platform. And like most of the top performers in GS, they are reputed to be good people as well as great athletes. But Denisov dominates this sport like no one else. He is truly in a class by himself. I'll close with the video of his world record performance. Until next time, take care and God bless. Hey, Chris. Thanks for your comment. Did he indicate what the mistakes were? I recall that he spends one workout a week using really light kb's (8kg?) to focus solely on technique. That says a lot about his attention to detail. Thanks for the follow up. Once my tendinitis heals I am going to go "Denisov" on LC (well, at least on my technique refinement). I had assumed my next KB purchase would be 2x32, but if I have the cash it looks like it will be remedial work with a new pair of 16's instead. I dropped the jump rope/one armed swings supersets because even the straight-armed stuff was aggravating my tendinitis. I'm having to let my upper body shrivel and just run and squat. I'm looking to run a 5k this summer, either later this month or July 4. Of course, Denisov runs marathons.